Industrial Design student needs your vote in Sneaker Championship! Artur Wrona, a second year Industrial Design student, has made it to the second round of competition in the World Sneaker Championship held by Pensole Footwear Design Academy in conjunction with Foot Locker. The top 64 designs were announced Sunday March 20, voting continues through Thursday, March 24. Entries come from all over the world, including Poland, Hong Kong Sweden and Mexico. Read more about Industrial Design student needs your vote in Sneaker Championship! Together with a team of engineers, designers and specialists, OCAD U alumnus Mauricio Affonso, has been working on an affordable solution to clean indoor air. GUNRID – The air cleaning curtain has been developed using a mineral-based surface treatment enabling the curtain to break down air pollutants when it comes into contact with light. The unique technology was developed by IKEA together with universities in Europe and Asia, IKEA suppliers and innovators. The air purifying curtain, available in IKEA stores next year, breaks down common indoor air pollutants such as odours and formaldehyde. Similar to photosynthesis found in nature, the process is activated by both outdoor and indoor light. Born and raised in Brazil, Affonso moved to Toronto to pursue his Industrial Design degree at OCAD U. Since graduating in 2007, his career has taken a stellar trajectory. After working as Creative Lead for Umbra, Affonso went on to graduate with a Master of Arts degree from the Design Products program at the Royal College of Art. Since then, Affonso has worked as a designer for LEGO in Denmark and he currently works in Sweden as a Product Developer for IKEA. Come see OCAD U Industrial Design Instructor, Laura Lovell-Anderson along with Jonathan Anderson on how Robotic fabrication strategically operates by deploying minimal material for maximal geometric definition and, as a medium, allows for the timely creation of precise and intricately crafted complex interior and exterior environments, as well as objects and surfaces. Building on the principles of computational craft, robotic fabrication seeks to build on recent advancements by examining the ways in which robotic arms have come to be seen as transcending their traditional role as performers of the monotonous tasks of mass manufacturing pipelines and instead be viewed as part of the toolset available for the production of crafted and unique work. These factors combined challenge analogue and low-tech design conventions to reconsider the entire design-to-production process, where the realities of innovative processes and solutions only seem to expand. The Lumas Gallery window display showcases a series of robotically 3d printed vessels. The 20+ vessels were all printed using a Kuka robotic arm with a custom engineered and built end effector. The brief was to design two gift products that represent the Canadian Identity on every level, at price points of $20 and $50. The products are to fit in a suitcase in order to be brought around the world and embody the Canadian spirit when given. In this way, the class was challenged to materialize the Canadian identity. 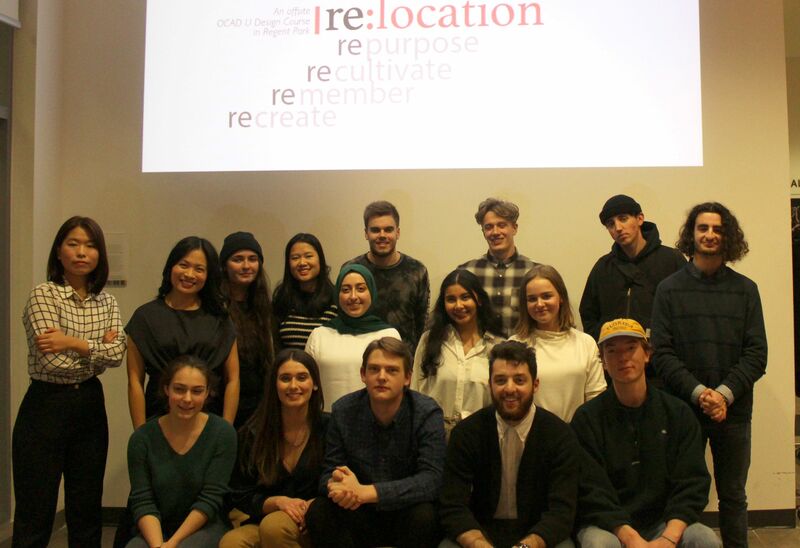 The students explored the theme of identity through analysis of iconic brands, lectures from veteran industrial designers and polling of Canadians about their understandings of self. Though the Canadian Identity may have seemed difficult to define at first, these students have come up with codified products that represent their findings about Canada emotionally, rationally, aesthetically, metaphorically and beyond. Theo Richardson & Luke Ceolin designed a line of planters in maple wood containing maple tree seeds to give the gift of the iconic Canadian maple in a package that can fit in your carry-on. Anna Lucia Zablah & Edward Chan designed a line of drinking accessories in stainless steel and wood that foster a Canadian atmosphere no matter where used. Max Minuzzo and Justine Orbovic explored wood bending patterns to create unique light designs that use shadows and light to change the atmosphere of any space. Connor Shopa has created two tabletop products, the mountain shaker and fire pit lamp that are inspired by Canadian elements and traditions. Austin Mercieca and Nathan Henry designed arctic-inspired products including an inuksuk Aurora Borealis mood light made of walnut and a narwhal letter opener made from steel and maple wood. Jason Cheng and Oleg Gorlenko designed a multipurpose rack and sunrise clock/light with Canadian materials and aesthetics in mind. James Zhao and Ayomide Olagbemi designed the aurora light and the osan citrus fruit squeezer, perfect gifts for loved ones. Danny Kim and Ethan Shin designed The Canadian Chessboard and The Gray Jay Hoodie to add a Canadian cultural influence into people's daily life. Join us Monday, December 10th at 6:00 pm at Bergo Design, 28 Tank House Lane, to experience the future of design by the next generation of Canadian designers. Phil co-founded Cervelo Cycles with Gerard Vroomen in 1995. (the name Cervélo is a portmanteau of cervello, the Italian word for brain, and vélo, the French word for bike). Over the next ten years it became the engineering leader in the bike industry and, arguably, completed redefined it. With a focus on technical and marketing innovation, Cervelo grew from a garage startup to become the most popular triathlon bike in the world (based on the Ironman bike count) and the most popular bike in pro cycling (based on Cycling News reader polls). Tour Magazine recognized Cervélo as the continued engineering leader when they found it was the fastest bike in every category that they tested- aero road, lightweight road, and TT/triathlon. Cervélo was the first bike company in decades “to put our money where our mouth is”, and drive the sport forward by starting our own pro cycling team - the Cervélo Test Team- which became the #1 ranked team in the world within 6 months. But the Team also innovated in many other areas as well including fan engagement and product development as well as behind the scenes. After the sale of Cervélo to Pon Holdings in 2012, I stayed with Pon as the non-executive Chairman of Cervélo, and as a Board member & the Chief Innovation Officer of Pon Bike. In July 2017 Phil left his positions at Pon and Cervélo to pursue other adventures in innovation, mobility, and performance. Phil continue to believe in the power of entrepreneurship, innovation, & design. He has been a guest lecturer on these topics at a variety of Universities and Colleges in Europe and America including, the University of Toronto, Ontario College of Art & Design University, Universities d’Ottawa, and École polytechnique fédérale de Lausanne (EPFL). As well as an advisor and Board member to a number of companies and organizations, and has been a regular guest on various business & technical forums. Assistant Professor Ted Hunter of the Industrial Design Program's company Roarrockit is supporting the Oasis Skateboard Factory Alternative High School Design Program, April 4 to 12. This year's show features work from the first year students showing their 3D skills. Two exhibitions created by OCAD University faculty and students have been included in the Toronto Design Offsite Festival Features, a juried selection of the ten shows not to be missed. This exhibition presents design speculations on Black-centric societies that are devoid of oppression, discrimination, and systemic racism. What do these societies look like? How do they function? How can these futures be achieved? Participants provide opportunities to explore these questions in an immersive and collaborative environment. Works of design speculation across a variety of mediums are on display, including prototypes, videos, and interactive experiences. Co-curators, Andre Baynes and Chiedza Pasipanodya showcase the intergenerational talents of twenty OCAD University Black-identified designers/makers and partners. The Hacking Black Futures exhibition aims to directly address the erasure of Black people in speculative design as well as represent the growing ownership of our own future narratives and practices of making. 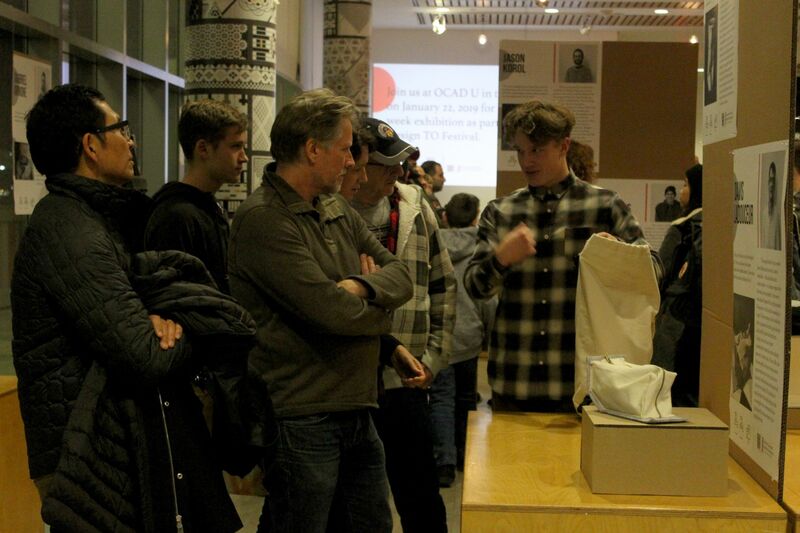 This exhibition by the Faculty of Design’s undergraduate and graduate Design for Health and Wellness students includes a ‘how to’ guide’ for pop-up supervised injection sites (SIS) in response to the urgent need to provide safe spaces for those risking overdose, alongside re-imagined Naloxone (opioid overdose antidote) kits for various public locations. Another group of Design students created solutions for independent learning and play for students with cognitive and physical impairments. A shortlist of the most successful projects will be on display, several of which have been manufactured and donated to a special needs school. Design students gained empathy through observation and benefitted from feedback of the teachers and occupational therapists working with the children. This research project is supported by St. Clements School and the OCAD U Research and Innovation office. Festival Features is a shortlist of 10 events, exhibitions, and/or window installations selected by a jury. The criteria for selection is entirely up to each juror, while considering the calibre of the work or event program, and appeal to a general public and specialist audience. This year’s jurors are Anahita Azrahimi (Toronto Outdoor Art Exhibition), Nina Boccia (Design Exchange), and Brendan Cormier (Victoria and Albert Museum). Visit the exhibition listing in the Festival Schedule to learn more about the exhibition.